It always seems like a good idea to buy more donuts than you really need, doesn’t it? Personally, I can never decide which kind to get, so I grab a couple extra. And then I grab an extra one, just in case a friend gets jealous and wants one … and before I know it, I’ve picked out a dozen. Someone will probably eat them, right? But as the day goes on, the donuts get less and less attention, and the next day nobody’s even opening the box to see what flavors remain. They’ve gone stale. If you’re watching your email open rates drop, you might know exactly what I’m talking about. No matter how enthusiastic your subscribers are when they first sign up, over time some of them will open your emails less and less. It might be that your emails feel a little stale, or it might just be the result of a crowded inbox and a cramped schedule. No matter the cause, if this goes on long enough, your declining open rates could even affect your sender reputation and start getting your emails sent to the dreaded spam folder. So, how do you avoid a stale list? In this post, I’m going to share one of our favorite re-engagement campaigns to revive your subscribers’ attention and keep opening your emails. Step by step, here’s how to make sure the people on your email list are excited to be there. The first step in sending your re-engagement campaign is deciding who you’re sending it to. So you’ll have to put yourself in the mindset of your subscribers and think about what inactive means for them. This depends on many factors, but the easiest to consider is how often you email your list. If you only email your list once per month, it’s going to take a lot longer for it to become clear that someone is really inactive and not just on vacation that week. If you mail every day, however, it might be clear after only a couple of weeks that someone isn’t reading what you’re sending any more. If you’re using Drip, you can define email inactivity by setting a number of unopened emails or a time period of non-engagement. To collect these subscribers into one segment, go to the Subscribers tab and set up a new bulk operation. Ask yourself when subscribers who aren’t engaging with your emails be ready to be removed from your list. Then, subtract a few emails or weeks and send your re-engagement campaign before you let subscribers get to that point. Your campaign to win readers back will be more effective if they haven’t completely forgotten who you are. Now, it’s time to send your re-engagement campaign. You can send one email or a few emails, choosing from several strategies to set yourself up for success. Subscribers are on your list because they signed up for it. So, reminding them why they signed up in the first place can be a good strategy to keep them on board. What kind of content do you send your list? Do they get exclusive downloads, the inside scoop on your business, or special discounts? Remind them of those special goodies. You could even take the opportunity to remind subscribers about a time your list got first notice about a product launch or a special invitation to an event. Provide a bit of social proof by reminding them how many other people love hearing from you on a regular basis. If you’re doing a one-time reengagement campaign, you can even time this email to tease an upcoming announcement that only your subscribers will get to hear. Depending on your business model, it might make sense to offer a discount, a bonus, or some special gift to your followers who aren’t engaging with your content. If you’ve been using content upgrades as a list-building strategy, you could send your most popular one. If you have hidden content or an interview series that you can share, you might send a link to that. Or you might offer a discount code on your product. In this example, Adam Chandler offers a link to a “mystery gift” to subscribers to keep them engaged. In Drip, you can make your “special gift” link into a trigger link to confirm that subscribers have successfully re-engaged. Whether or not you call it a mystery, you can assume that readers who click through to get your bonus, discount, or free download probably like your material enough to stay on your list. You can go as far as Adam does and actually remove people who don’t click, or you can make this email the first in a several-part sequence. Then, just ask whether they still want to hear from you. 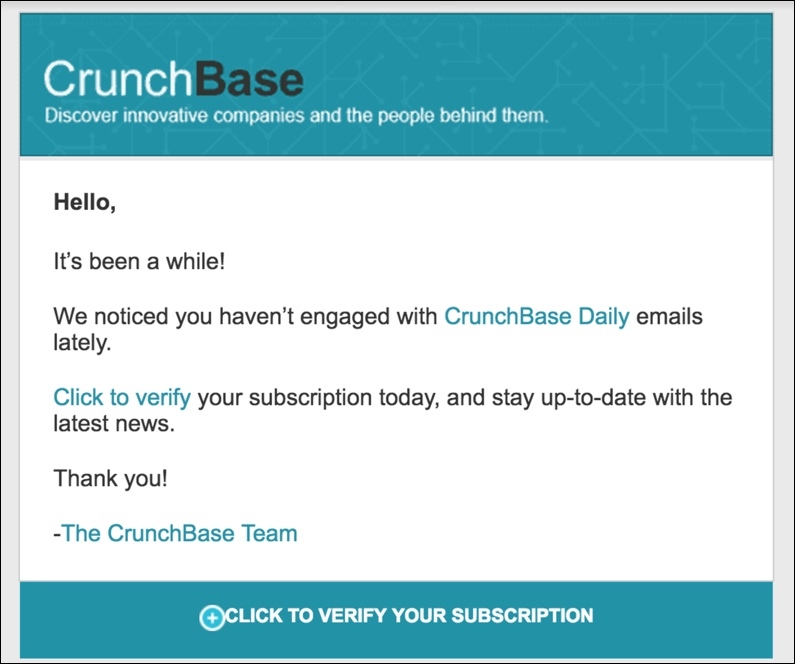 In this short email from CrunchBase, they simply say: we noticed you aren’t engaging, click here if you want to keep hearing from us. You could also include three different links: one to unsubscribe, one to stay on the list, and one to get less frequent emails (in which case you might remove them from your daily email blasts, but keep sending monthly newsletter updates). Either way, choose a tone that fits with your brand but grabs attention—after all, you’re talking to your hardest-to-reach group of subscribers here. After this re-engagement campaign, you’ll be confident in pruning your email list, knowing that the subscribers you ultimately remove really weren’t engaging with you in the first place. 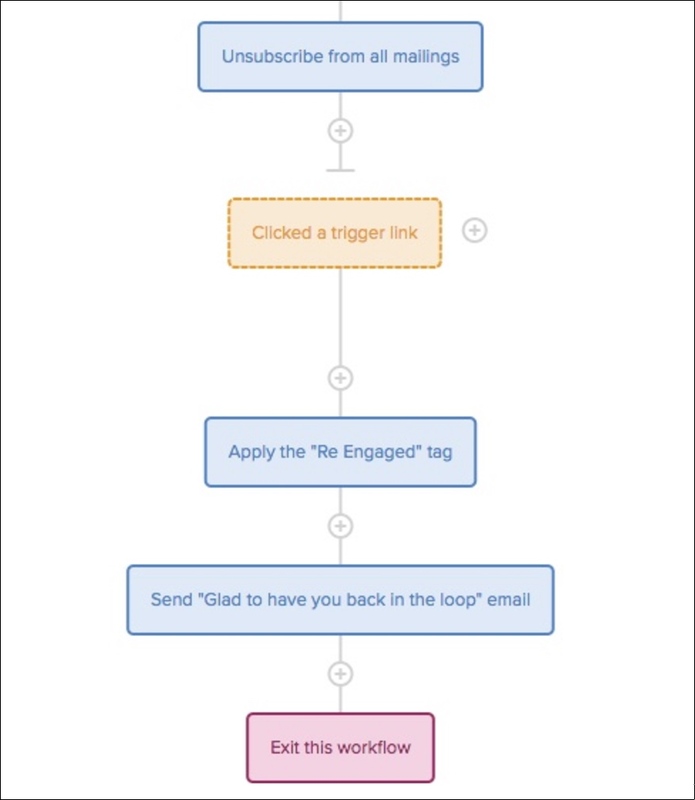 In order to set up a re-engagement workflow that automatically deletes subscribers, create a workflow without a trigger that adds a “Re-Engagement” tag (if you want to keep track of who is moving through the re-engagement workflow) and sends your campaign. 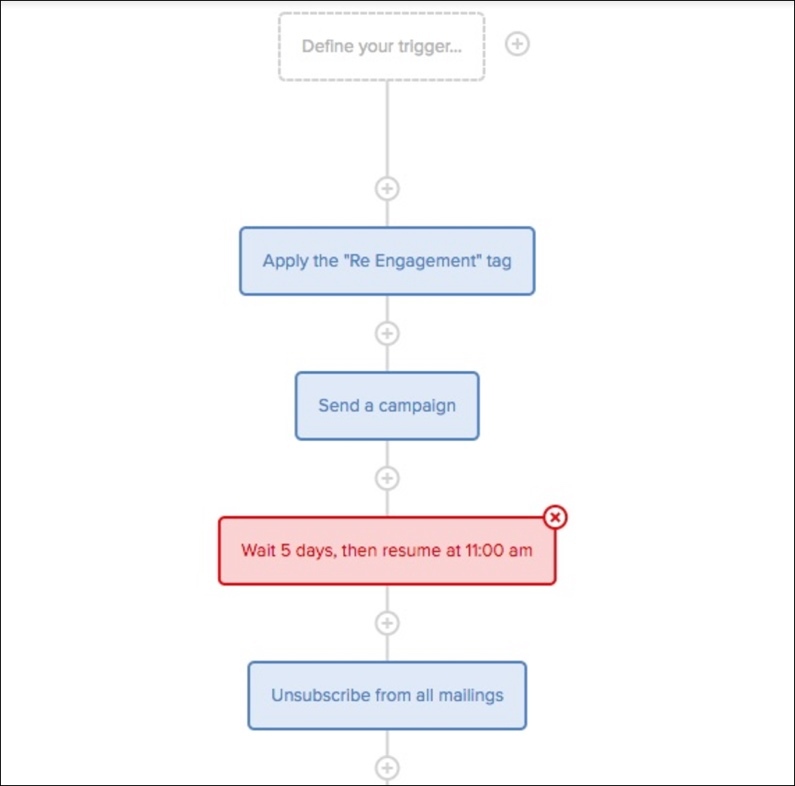 You don’t need a trigger because you can use a bulk operation to send inactive subscribers to this workflow. To ensure that you don’t delete subscribers who click on the link in your email, just create a goal of “clicked a trigger link” or “opened an email,” depending on which re-engagement threshold you’re using. After someone opts back in, you can apply a tag (for tracking purposes) and send a confirmation email, if you’d like. While it hurts a bit to say goodbye to old subscribers, know that you’re ultimately building a much healthier list that opens your emails with pleasure.